Don't miss out on our free resources and guides. Sign up to get our regular digest in your inbox. 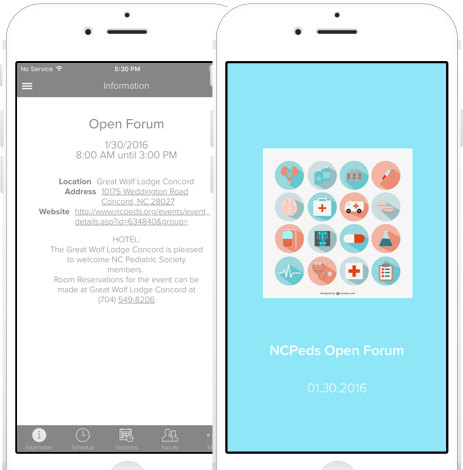 First, let’s talk about why your association meetings need a mobile event app. Why should you invest in one? Time and resources are always strapped at associations. This means, that the team in charge of meetings is having to scrape corners for event details and roll up their sleeves to get things done. John of NCPeds told us that him and his colleagues were spending 120 hours in manual labor to create printed agendas. Switching to mobile apps for meetings allowed them to get all of this information into the app in a matter of minutes! Printing paper agendas can cost thousands of dollars. Plus, there is the cost of binders, deliveries, tote bags and everything else that printing bio books brings with it. A mobile app for your association meetings can actually save you all of this money and help you increase sponsorship revenue resulting in a dramatically better ROI than paper. You too can easily take your events mobile, ditch paper and avoid confusing email chains with this guide. Switching to mobile definitely will save you organizational time and money. However, more importantly it helps meet many goals most membership organizations have at events as well as year-round. Below we’ve highlighted 6 ways to leverage a mobile event app for your association. The most basic and practical reason to use a mobile app for your association meetings is the logistical benefits that come with being able to get members the information they need about the event at their fingertips! You can upload documents, create a schedule and add in all other event information all in one place. Plus, with the right app you’ll even be able to update this information instantly if changes come in and notify your attendees with a push notification. Networking has to be one of the top reasons for most members to join an association – they want to meet, connect and get to know other members in their industry. A mobile event app, will make this a breeze. Attendees can browse through a list of bios for all attendees. They can even connect with other members directly from the app by accessing links to their email, phone or social media profiles. They can chat, post comments or upload photos to the event app leading up to, before and even after the event. Your sponsors and other partners help make your events a reality. It’s important to give them the coverage they deserve throughout the event. With a mobile app for your association meeting you can feature sponsors in the app in a variety of ways even before the event. A 500-word description is much more powerful when it’s accompanied with a direct link to the sponsors site. All this means, a better ROI for your sponsors which means an increase in sponsorship revenue for your association! You collect feedback from members as you strive to improve not just your events but their entire membership experience. This means more feedback and data the better – this is where event apps come in. Leverage features such as polls, real-time analytics and session feedback to find out what your members opinions are about your meetings and association. Read about 5 ways you can collect feedback in an event app. 56% of associations admit they have trouble engaging young professionals, and 55% of associations have trouble customizing their communications for different member sub-groups. With mobile penetration at 90% for millennials, it’s more important than ever to use a mobile event app at your association meetings so you can engage and retain your younger members. They’re on their mobile devices anyway, so if you want to connect with them at your events, a mobile app is the way to go. One of the benefits of bringing together members at meetings is to get them excited about being part of the association and help them connect with the mission and goals of the association. An event app can be great resource for this. Putting your association’s mission and goals in the event app is a great way to remind everyone why they joined the association in the first place. Something simple as a welcome page highlighting photos of members and a letter from the Executive Director or other leadership will set the tone for the app. It only took them three hours to make their app, and they ended up saving 60 percent in printing costs as well as 120 hours in labor. They use Yapp to create apps for their events throughout the year especially to engage their younger members. This AMC uses Yapp for their clients. They switched from a native app which resulted in incredible cost savings and members liked the Yapp apps better! Are you worried that a mobile app is going to be a massive investment of time, money and resources? Not true! You do not have to be an IT wizard or a skilled designer to create a mobile event app. There are self-service app creation platforms out there that can help. Yapp is one such example. Yapp empowers association professionals to create meeting apps in the easiest, fastest and most cost-effective way. Get your 14-day free trial of Yapp today. Did we miss any other key benefits of an association meeting app? Tell us below! Sweta is the Director of Marketing at Yapp, an easy-to-use, cost-effective and engaging mobile event app solution. She helps professionals from small associations to large enterprises discover and utilize Yapp to create mobile apps for their conferences, meetings and employee engagement. New Paid Feature! Adding banner advertising to your mobile experience. Like what you’ve read? Learn more about Yapp!